Cytokine array is an antibody-pair-based assay, analogous to ELISA, but uses a membrane as a substrate instead of a microplate. Capture antibodies are spotted on a membrane, each spot representing a different analyte, and are used to capture antigens from a complex sample (Figure 1). Cytokine array is rapid, sensitive (low pg/ml), and economical for simultaneously detecting and quantifying the relative levels of many different cytokines (hundreds) in a single sample. The Cytokines, chemokines, and growth factors have been linked to many diseases such as autoimmune diseases, diabetes, allergies, vascular diseases, cancer, etc. Cytokine arrays are cost effective for studies which involve many cytokine targets but smaller sample numbers. Figure 1. 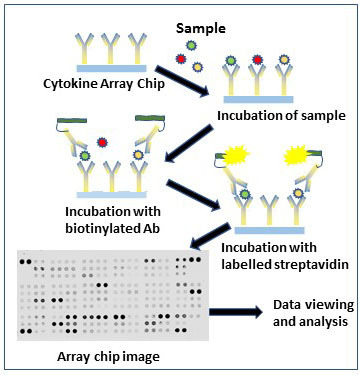 An illustration of Cytokine Array assay. Chen, W., et al. Cancer-associated fibroblasts regulate the plasticity of lung cancer stemness via paracrine signalling. Nat. Comm. 2014, 5, article 3472. doi:10.1038/ncomms4472. Glück, S., et al. Innate immune sensing of cytosolic chromatin fragments through cGAS promotes senescence. Nat. Cell Biol. 2017, 19:1061-1070. doi: 10.1038/ncb3586. Liu, Y.C., et al. Cytokine MIF Enhances Blood-Brain Barrier Permeability: Impact for Therapy in Ischemic Stroke. Sci. Rep. 2018, 8:743. DOI: 10.1038/s41598-017-16927-9. Multiplex immunoassay (MIA) is a high-throughput, highly specific and highly sensitive (low pg/ml) immunoassay that uses antibody conjugated microspheres and a suspension array to simultaneously detect and quantify multiple analytes in a single sample. MIA is predominately performed for measuring concentrations of cytokines, chemokines, growth factors, and phosphoproteins. There are many human assays available such as cancer biomarker panels, diabetes, metabolic, hormonal, inflammation, cell signalling, kidney toxicity, acute phase, isotyping, etc. Target molecules are detected from body fluids, cell culture supernatants and tissue samples. In addition to human assays there are several animal assays available, such as canine kidney toxicity, mouse and rat cytokines, etc. MIA is performed at APAF using commercially available assay kits; there are numerous analytes available from different companies producing kits for MIA partnering with Luminex Corporation. This assay is suitable for a study that involves many cytokine, growth factor and acute phase proteins and many samples. APAF does not analyse multiple client’s samples in one plate. APAF uses epMotion robotic workstation for liquid delivery for precision and reproducibility of the MIA assays (Figure 2); this resulted in low intra-plate technical reproducibility (2.6% CV) and inter-plate CVs of 7.6%, observed from 27-plex 19 assay plates and assays conducted over two weeks’ period. Figure 2. Robotic liquid handling workstation (epMotion 5075, left) for precision and reproducibility and Bio-Plex 200 system (right) for plate reading for multiplex immunoassays. To show case the reproducibility of the MIA platform at APAF we serially diluted 27 cytokine standards in each plate and 19 assay plates were overlaid which showed an excellent reproducibility of each cytokine (Figure 3). Figure 3. Reproductivity of MIA data at APAF. APAF’s Biostatisticians, experts on MIA data analysis, are available for your data analysis needs and interpretation of results. They can also help in planning an experiment to ensure that sufficient sample size and statistical power are available to answer specific research questions. Our biostatisticians use the latest statistical, modelling procedures and global analysis strategies, which ensure the lowest possible false positive and negative rates. These procedures and algorithms are different compared to conventional statistical and stratification methods, and often reveal deeper analytical results with higher statistical power. Consult our recent publications on MIA data analysis. Breen, E.J., Tan, W., and Khan, A. The Statistical Value of Raw Fluorescence Signal in Luminex xMAP Based Multiplex Immunoassays. Scientific Reports, 2016, 6, Article number: 26996. doi:10.1038/srep26996. 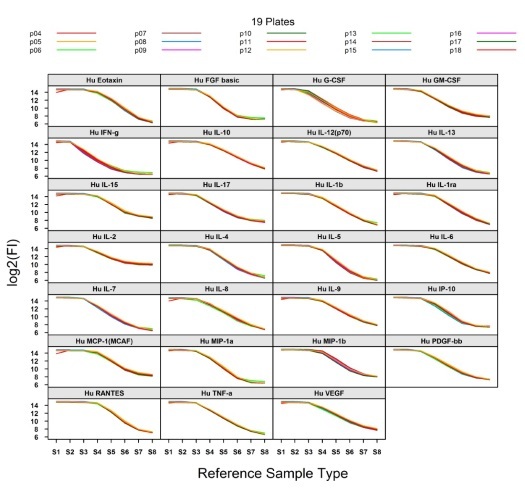 Breen E.J, Polaskova V., Khan A. Bead-based multiplex immuno-assays for cytokines, chemokines, growth factors and other analytes: Median fluorescence intensities versus their derived absolute concentration values for statistical analysis. Cytokine. 71(2):188-98 (2015). DOI: 10.1016/j.cyto.2014.10.030. A. Khan. Detection and quantitation of forty-eight cytokines, chemokines, growth factors and nine acute phase proteins in healthy human plasma, saliva and urine. J Proteomics. 75(15):4802-19 (2012). DOI: 10.1016/j.jprot.2012.05.018.